What makes giffgaff special – worth learning from? Some customers love giffgaff so much that they are willing to have giffgaff tattooed on them. If this does happen then it puts giffgaff in the same league as Harley Davidson and Apple – brands that have fans not just customers. giffgaff won the Marketing Society’s 2011 best new brand award . And in the customer management community some hail giffgaff as representing the future of customer service. So what makes giffgaff special – different from the pack? First let me tell you a little bit about giffgaff. Vodafone, O2, Orange, T-Mobile, 3 – are the main brands that dominate the UK mobile telecoms industry. giffgaff is an MVNO (mobile virtual network operator) that launched towards the end of 2009 and piggybacks on the O2 network. And in that sense giffgaff is rather like Virgin Mobile (the first commercially successful MVNO in the UK) and say Tesco Mobile. So what makes giffgaff special? It is not one thing, one ingredient, it is the entire recipe – the whole business model and organisational design. In a way it is like the way that Dell (at the start) rethought the PC industry or Ryanair / Easyjet / Southwest Airlines rethought the airline travel industry. Let’s start with customers. It would not be too much of a stretch to say that giffgaff does not have customers – at least not in the traditional sense of customers simply as consumers. giffgaff has members. Customers are seen as members who are involved in, contribute to and carry out an array of organisational tasks: provide ideas, get involved in new product development, recruiting new members, serving other members (‘customer services’)…… Many pundits talk about putting customers at the heart of the organisation yet few organisations do that – giffgaff is an exception. There is a lot of talk about transparency, authenticity, mutuality, collaboration and co-creation yet few organisation do that – giffgaff is an exception. Finally, giffgaff is keenly focussed on its core customer segment (those looking for a great SIM only deal) and the associated value proposition (cheap calls, texts, internet). If you want to find out more about giffgaff then I suggest you listen to Tom Rainsford, Head of Brand and Proposition, giffgaff. For the rest of the post I simply wish to share with you my experience of dealing with giffgaff and why I am an advocate. To sign up with giffgaff you have to head over to their website as giffgaff is an internet only operation: there are no retail stores to visit nor call centres to ring. The first thing that I noticed was that it was easy for me to sign-up and request a SIM: the task was prominently signposted on the webpage and the task was easy as I only had to supply my name, email and address – five fields in total. Second, I noticed that giffgaff is great value for people like me – people who already have a phone and are happy to keep using that phone. On Orange, as a pay as you go customer, I had been paying 20p+ a minute and 10p for text messages. With giffgaff I would be paying only 8p a minutes for phone calls and 4p a text. Third, despite the fact that I knew absolutely nothing on phone unlocking, all the information that I needed to get my phone unlocked was on the website. Better still upon entering the make and phone model the giffgaff website provided a list of companies that are able to unlock my phone. And each of these companies was rated so I could just turn to the best rated one. Within two days I received the SIM card and it was easy to register my SIM card: I simply logged into my giffgaff account, entered a six digit code and then purchased a £10 goody bag that bought me 250 free minutes, unlimited texts and unlimited internet. Within 30 minutes my SIM was activated and I was making calls and surfing the internet. The process could not have been easier. In the process of purchasing the goody bag I noticed that the giffgaff website had an automated top-up facility. I simply had to activate and specify how much I wanted my top up to be and when the balance on my account hit a low of £3 giffgaff would automatically top-up my account thus making sure that I was never in a position where I had run out of credit and thus could not use my phone. This grabbed my attention because that was one of the tasks that I hated doing on Orange: topping up my phone and the phones belonging to my two sons. I still cannot believe how such a small feature delivers such a huge benefit to me: always being able to use my phone and giffgaff doing the work behind the scene. Whilst I was using the phone I got more suprises in the form of useful information: the giffgaff network regularly displays how many minutes I have left if I have bought a gift pack (a bundled package that expires at the end of 30 days). If I have bought ordinary minutes then giffgaff lets me know how much credit I have left at the end of calls. Finally, when I make calls to other giffgaff phones then the giffgaff network automatically informs me that the call was free. This is the kind of information that I had yearned for and never got from my previous provider. And it got me thinking: if giffgaff can do this then why did my old provider not do this? About two weeks later I got another pleasant surprise: an email from giffgaff letting me know that they were sending me an additional SIM card that I could give to a friend. And on the same day it arrived. When I opened up the envelope I noticed that I was not simply being asked to get a new customer for giffgaff. giffgaff had thought through the value exchange: once the SIM was activated then the person using that new SIM would be credited with £5 and so would I. So I was being rewarded for my effort. How could I refuse? My wife switched over from Orange to giffgaff. And she is delighted with the money that she is saving and how easy it is for her to manage her mobile account/relationship with giffgaff. At the end of the month I was able to view an analysis of my phone usage via the giffgaff statement. This took me by surprise because on Orange I simply got a list of phone calls I made chronologically. On the giffgaff site I got that and I got a bar chart type analysis which I found useful – it helped me to figure out what I had been doing with my phone. I was surprised and delighted by the thoughtfulness of it: giffgaff is providing me with information and tools that help me to be informed and make better decisions. Interestingly enough giffgaff beat me to that as well. Shortly after this experience I got an email from giffgaff telling me that they had done an analysis on my usage and had a recommendation for me. So I logged on the website and accessed that recommendation. The recommendation itself was no surprise but the fact that giffgaff was doing this was and is a delight. It was something that I had wanted from my previous provider and yet was never able to get. As a consultant I had advised a major mobile telco to implement this practice, as this telco wanted to improve the customer experience, yet management refused because it would have an adverse impact on revenues and profits because most customers were on tariffs that were too high and costly for them. Now this might not sound like a big thing and yet it is to me: the language that giffgaff use is a human one and that really connects with me. The other day I got a SMS message which delighted me both because it was unexpected and because of its simplicity. 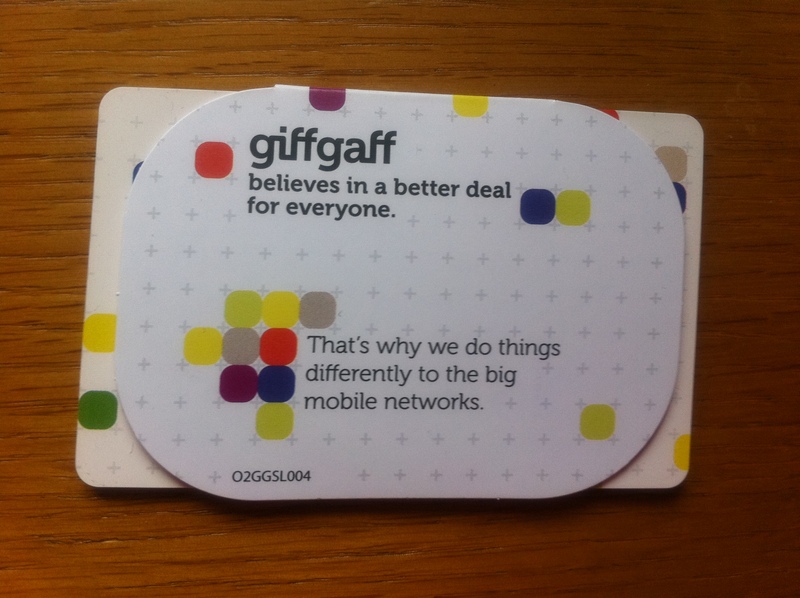 Here it is “Thanks for helping to grow giffgaff, you’ve earned ….so far. For more information and to check your recommended plan see My giffgaff at giffgaff.com, cheers!” I have recommended more than once the companies and marketers use a human language that speaks to connects with customers – that is something that giffgaff is doing rather well. Finally, I recently took my phone to France and got another pleasant surprise. On landing the mobile connected to a French network and up came useful information from giffgaff. I cannot remember the exact words yet the message was clear: we don’t want you to have any unpleasant surprises so lets make clear how much your mobile calls are going to cost. I was told that I would be charged 38p per minute if I was making the calls and 15p per minute if I was receiving calls. This is the kind of honest, proactive, information that I have always sought and never got from previous suppliers (mobile networks). Why am I a giffgaff advocate? I am adding giffgaff to the list of companies I recommend. Why? Simply because they have made my life easier by taking hassle out of it (e.g. automating topping up), provide me with useful information (how much credit I have left, how many minutes I have left, how much calls are going to cost…), talk to me in a human way (the simple friendly informal language), provide more value for money (cheaper calls, texts, internet..), reward me for the contribution that I make to giffgaff and the call quality / network coverage is as good as that provided by my previous supplier (Orange). Finally, I prefer being called/treated as a ‘member’ rather than a ‘target’, ‘consumer’ or even ‘customer’. How about you? I’ve heard a lot about GiffGaff and what they are doing and it’s great to get an insight into how they deliver from a customers perspective. I like their automatic top up idea….something that I first came across with Skype who have the same feature. One of the other things that I think is of interest is that GiffGaff is ultimately owned and funded by Telefonica O2 but is run as a separate company. Shows that large corps can do innovative stuff and makes me think that the model that they are employing here (customer management and engagement whilst surfing on central/core infrastructure) may be a corporate business model that we see more and more of in the future. Thanks for adding to the picture. I do know that giffgaff grew out of O2 and I am told that it is run as a seperate company because it offers a very different value proposition. Your comment on business model really speaks to me. What strikes me about Customer Experience is that really it is all about business model reinvention. The kind of reinvention that the likes of Build A Bear, giffgaff, Threadless are doing. These companies literally put the customer into the heart of their business. Without the customer doing key tasks (like marketing, selling, new product ideas, product development, customer service, product configuration….) these companies do not have a business! So I am going to take a much closer look at business model reinvention as that is where the future lies – as you correctly point out. Agreed. What is really interesting to watch (from my point of view) is how well they can scale the model given that their subscriber numbers are on an exponential curve. A really nice summary of your join experience – just goes to show that if you get some basics right: Service, Communications, Product and team that up with Brand principles of keeping things Simple and Transparent, you can make headway in a very crowded marketplace. Thanks for helping to grow giffaff! I am an evangelist for any company that does a great job of creating superior value for customers. giffgaff does that and I am happy to share that with the world especially when you have such an interesting business model and excel at cultivating membership and collaboration. Finally, thanks for stopping by and commenting. WARNING – BEWARE OF GIFFGAFF! Maybe they’re cheap, but they don’t have any customer service. The only way you can contact them is through the website – not even through email!!! I sent them a request for assistance through the site, and it took them 3 days to get back to me with an automatic response – irrelevant to my problem (much like pressing the help button in windows). Ever since, I’ve had about 20(!!!) different messages back and forth. Just imagine, each one of these messages is answered by a different person. Which doesn’t really help to solve the issue. And giffgaff CLAIM THEY WILL NEVER COMPENSATE YOU! EVER! (as directly been told to me by an agent). So consider this – you pay in advance, but if you don’t get the service you paid for – your problem! Previous Previous post: The future of retailing: is it really all about technology?